Having already recorded and produced over 10 acclaimed records, had multiple live sessions and airplay on BBC Radio 2 and 3, and his music regularly featured on Sky Arts and Sky Sports, it’s hard to believe that 24-year-old Cornwall-based folk singer, producer and multi- instrumentalist Sam Kelly has only been performing live for 4 years. With folk luminaries such as Kate Rusby, Seth Lakeman, and Cara Dillon waxing lyrical about Sam’s live set, it seemed fitting when he was awarded the prestigious Horizon Award for emerging artists at the BBC Radio 2 Folk Awards 2016 at London’s Royal Albert Hall. 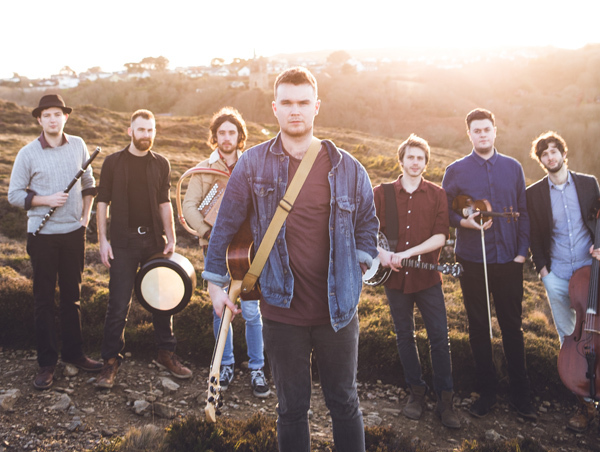 Joining Sam in the full band line up for 2018 are Ciaran Algar (fiddle, tenor guitar, bouzouki), Jamie Francis (banjo), Toby Shaer (flutes, pipes, whistles, fiddle, cittern), Graham Coe (cello), Archie Moss (melodeon) and Evan Carson (percussion). Together, they are Sam Kelly & The Lost Boys.